If you’re reading this blog, or if you’ve ever been on the internet, ever, you’ll know what an animated GIF is. And if you’ve spent a bit of time on Instagram, you probably know that GIFs used well can be really eye catching and beneficial to your business (whatever your business may be!). In my case, it’s a great way to further show off my designs. 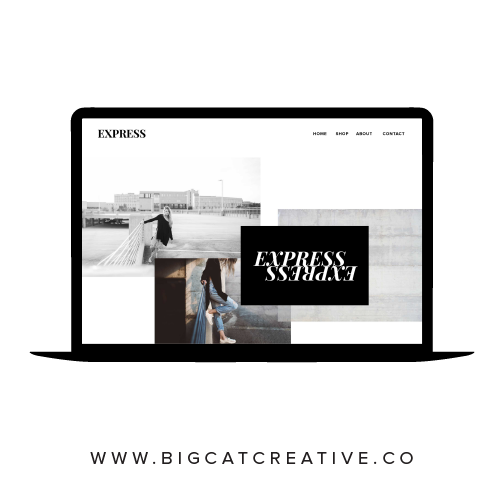 Below is a recent example of a GIF I created to show off a complete website page design, which I wouldn't be able to do with a static image. You can use these GIFs anywhere online, but in this tutorial I’m going to show you how to create them for Instagram. Don’t worry, it’s actually really simple! First we need to create each frame of the animation, you can see below an example of the different frames I created (this is only 3, the complete GIF had around 50 frames). You can create as many as you want. Once the GIF is complete, it will show one frame after the other to create an animated effect. You can use Photoshop, and create every different frame as an individual layer in the same document. Or, you could use any program that you’re comfortable with to create your frames, I personally use Illustrator, as long as you can export each frame as a different image at the end. For Instagram, the ideal size is 640px x 640px, so that is the size you'll want to create your page/artboards. Create each frame one by one until you're complete. I ended up with around 50 different frames (artboards) for this particular GIF, but you can use as little as 2! Seriously, that’s the hardest part done! If you created your frames in Photoshop as different layers, you can skip this next step because your images are already loaded into Photoshop. If you created your frames in another program (like illustrator) you'll need to export them as separate image files (eg, .png or .jpg). Now we need to upload these into Photoshop. Click Browse, and select all of the frame files that you just created. Then click Open. Photoshop will then create a new layer for each of your frames. This will open up a box at the bottom of your window as below. Select Create Frame Animation. and click Create New Layer for Each New Frame to tick it. From here you can choose how long each one displays. I chose 0.2 for my speed. TIP: You can select all frames (by holding down Shift) and change the time on one of the frames and this will change the time on all of the frames. At the very bottom you can also choose if you want it to loop once, 3 times, or forever (I chose forever). If you want to preview it, press the Play button at the bottom. TIP: If it’s going backwards, go back to the small button on the top right of the Timeline panel and click Reverse Frames. If you’re happy with your GIF, and you want to save it, click File > Save for Web and save it as a GIF 128 Dithered. Great! You've successfully created your GIF, and now you should be able to upload the GIF anywhere online! The catch is, Instagram doesn’t actually support GIFs. BUT, it supports video files (mp4). So we need to convert our GIF to an mp4 before we can upload it to Instagram. There’s plenty of online resources to help you do this. I use EZGIF.com to upload my GIF and convert it to an mp4. Then download it as an mp4 and voila, you can now upload this mp4 file to Instagram! TIP: Apple doesn't make it easy for you to download mp4s to your phone, so this is how I get the video from my computer to my phone: I save the mp4 into my Google Drive, which is linked as the Google Drive app on my iPhone. From the Google Drive app I select the mp4 and choose "Open In", and I post directly to Instagram from there. Let me know in the comments below if this is how you do it, or if you have any other suggestions on how to create these GIFs! I hope this tutorial helped, link your Instagram below so we can connect!